With 1 person in mind, you the beginner, using just 2 simple beading techniques and 3 basic jeweler's tools will take you from beading nothing to beading something. 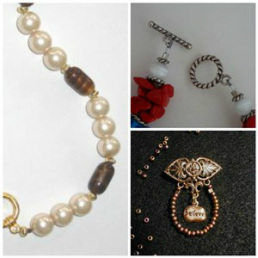 With the simple techniques taught in this series of 'Basics to Beading' you will be able to easily begin creating beaded jewelry as either a relaxing hobby or a profitable business. Many are pleasantly surprised how doable, easy and affordable it really is. Best of all...NO PREVIOUS EXPERIENCE NECESSARY!!! Here is what I share in the classes. Learn the basics of making a bracelet or necklace. 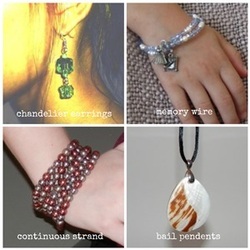 In this class we will cover the tools, techniques, terminology and materials, used to design and string a beautiful bracelet using glass and metal beads. By learning the crimping technique you will be able to make necklaces, bracelets, earrings, anklets and many other items. 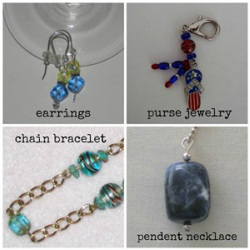 Learn the basics used to create earrings, pendents, bookmarks, keyrings and more. In this class we will cover the tools, techniques, terminology and materials used in creating single or plain loop using head pins to create earrings and so much more. Learn the other mysteries to creating basic beaded jewelry unveiling little secrets that are so simple you will be shocked! In these classes we will expand building on what you have already learned from Basics to Beading Class 1 and Class 2. I will introduce other basic beading materials and our projects will manipulate the beads differently to create a variety of looks. In addition to learning new materials, new tools will also be introduce to continue to grow you knowledge in this simple and easy world of beaded jewelry. We are currently moving physical locations so at this time there are no off-line classes available. Be sure to check back for updates or be kept in the loop by signing up for the Bead At Home newsletter for more information. Visit Beading Jewelry 101. This is your virtual classroom to get you started on your first project. with me as your private instructor, moving at your pace. Come by for a visit and see what's going on. I'll leave the light on. I look forward to seeing you there and as always I'm glad to serve your personal beading needs.